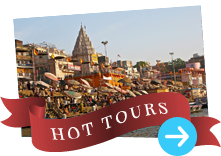 History of Varanasi, History of Kashi, History of Banaras, Holy city of Varanasi, history of Varanasi Ghats. Located in Uttar Pradesh, Varanasi, or Benaras, is one of the oldest living cities in the world and its prominence in Hindu mythology is virtually unrivalled. 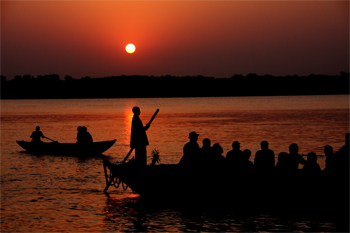 One of the earliest descriptions of Varanasi is found in the Buddhist scriptures and in the epic, 'Mahabharat'. The name of the city is said to come from a number of different sources and we will let you, the visitor, decide which version suits best. The first is the 'Pali' version which tells us that 'Baranasi' ultimately gave birth to the name 'Banaras' one of the city’s first official names. Another version tells us that according to the 'Vamana Purana', the Varuna and Assi Rivers gave the city its more modern name and as the city is situated on land between these rivers, is probably the more reasonable version today. 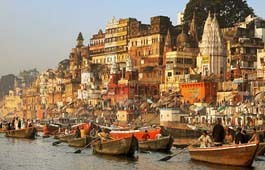 However Varanasi also goes by the name of Kashi (derived from the root 'Kas' - to shine) or the city of spiritual light. Steeped in tradition and mythological legacy, Kashi is the 'original ground' created by Shiva and Parwati, upon which they stood at the beginning of time. Thus all three names are often used today, which you choose, is up to you. Varanasi is the microcosm of Hinduism, a city of traditional classical culture. Glorified by myth and legend and sanctified by religion, it has always attracted a large number of pilgrims and worshippers from time immemorial. As mentioned, the city finds mention in the great epics of Mahabharata but also of Ramayana and was already old when Rome was founded. It was a flourishing centre of trade when Buddha came to Sarnath, some 10km away, to preach his first sermon in 500BC and is said to be thousands of years old having attracted pilgrims from near and far since beyond human memory. Due to its location and prosperity, Varanasi was raided over and over again by Muslim rulers; from Mahmud of Ghazni to Ghauri to the Delhi Sultan Alauddin Khilji and most of all, the Mughal Emperor Aurangzeb. As a result, most of the ancient temples and other structures were destroyed. What remains now is mostly about 200 years old, and not many which are earlier than the 17th century. The history of Varanasi lives however, in the repository of old manuscripts, the folk traditions and most importantly, through its people all of which beg your discovery.